Trioses: Trioses are simple sugars derived from hydrolysis of oligopolysaccharides. (a)Aldoses: Sugars with terminal CHO aldehyde group aldotriose- Glyceraldehyde (simplest sugar). Ketohexose – Fructose – It is the sweetest among all the sugars. Sucrose: Produced from alpha glucose beta fructose by alpha. –1.2. glycosidic linkage. It is a Non- reducing sugar. Maltose: Consists of 2 units of glucose linked together by alpha 1.4 linkage reducing sugar found in germinating seeds largely. Cellobiose: Consists of 2 units of glucose but the bond involved is beta, 1.4 linkage. It is a reducing sugar. Lactose: Consists of one molecule of beta D glucose and one molecule of beta D galactose linked together by beta 1.4 linkages. 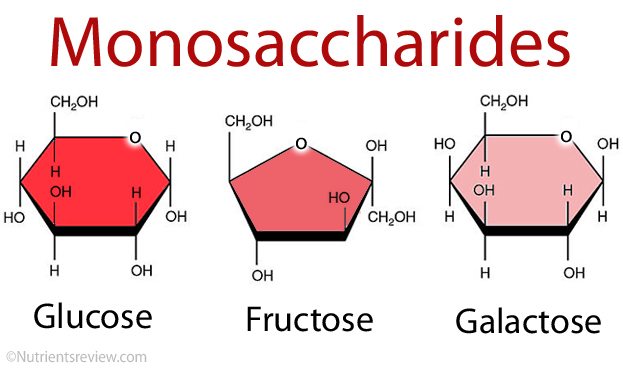 Stachyose: It is a tetra saccharide consists of one glucose and one fructose and 2 galactose. In plant consists of amylase, amylopectin. (It is polymer of glucose). Amylase: Amylase is un-branched chains of glucose units joined by alpha – 1.4 linkages. The chain is nonlinear, but it is helical one. Amylopectin: It is highly branched, Bond types: Alpha-1.4 linkage but at the branching points alpha 1.6 linkage is present. Glycogen: It is present only in animal cells. It is just like starch, but heavily branched and compact and it contains both alpha 1.4 and alpha 1.6 linkages.